Paul Petersen on his way to a second Horsetooth Half Marathon win in 2015. We’ve got a strong elite field lining up for the race this Sunday. They’ll all be vying for a piece of this year’s $4,000 prize purse. We have two returning champions in the men’s field this Sunday. Local favorite, Paul Petersen set the current course record (1:10:32) in 2013 and won again in 2015. Mark Charles (aka Horsecow Lonac) was the 2009 champion and will also be lining up on Sunday. Lonac is the XC coach at Blevins Middle School and will be cheered on by his team who will be working the 8.5 mile water station. 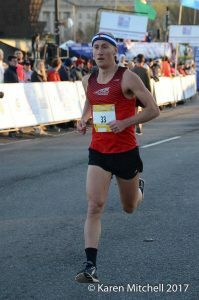 Pushing our two previous champions will be Tyler McCandless, a Boulder pro who holds a 1:03:14 half marathon PR and is coming off an impressive 48:30 finish at the Cherry Blossom 10 miler in D.C. earlier this month. Tyler will be joined among the favorites by Gebre Abadi, winner of last year’s Denver Half Marathon and claimant to a 2:12:38 marathon PR. Also among the favorites is assistant CSU track and XC country coach, Scott Dahlberg who has recently stepped up in distance, clocking a 1:06 half in San Antonio in December. Other runners with elite bibs that we expect to be pushing the pace up front include local standout and 2016 podium finisher James Vance; Mississippi State standout and volunteer coach for the CSU XC team, Andrew Monaghan; and last year’s King of the Mountain Ben Wheatley. 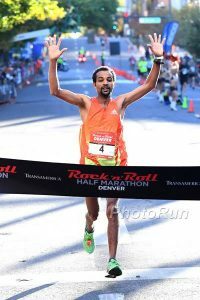 Gebre Abadi winning the 2016 Denver Half Marathon. He will be among the favorites at the 2017 Horsetooth Half Marathon. 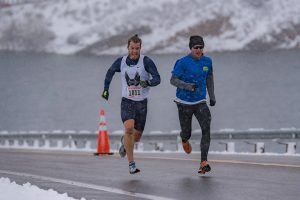 Can Ben Wheatley (white singlet) defend his King of the Mountain crown at the 2017 Horsetooth Half Marathon? $100 says he can. 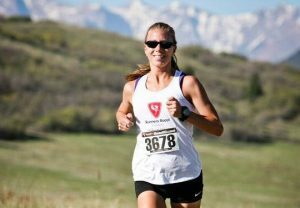 In the Women’s field, three time winner, course record holder, and defending champion (yes, overall champion), Brianne Nelson will not be toeing the line this Sunday, which leaves the Horsetooth Half Marathon women’s race wide open for 2017. Among the favorites will be 2015 champion Kara Henry Mills who’ll be racing Horsetooth as one of her first races back after a long injury lay-off. In 2015 she won the race in a time of 1:24:29. Kara Henry Mills at mile 10 of the 2015 Horsetooth Half Marathon on her way to breaking the winner’s tape. Last year’s runner up Heather Utrata will be back on the starting line this Sunday, and she’ll be looking to go one better than in 2016 when she finished in 1:26:16. Heather is coming off a recent win at the Spring Equinox Half Marathon here in Fort Collins. 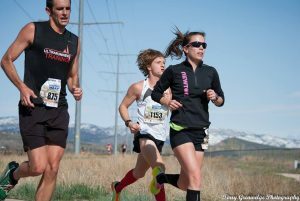 Heather Utrata was second last year’s Horsetooth Half Marathon. Can she go one better on Sunday? Local favorite AnnMarie Kirkpatrick finished fourth in last year’s race and appears to be in good form, having just run a 2:55 for an eighth place finish at last month’s LA Marathon, which surely puts her in podium contention. Arizona Wildcat alum, Maggie Callahan has a half marathon PR from early 2016 of 1:16:57 and will certainly be among the favorites for the win this weekend. 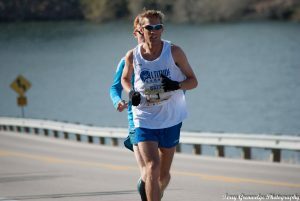 Second to Utrata last month at the Spring Equinox Half, Becky Lynn will be looking to make some noise on Sunday, as will 2013 second place finisher Sarah Jo Omann and multi-time top-five finisher Jennifer Malmberg. 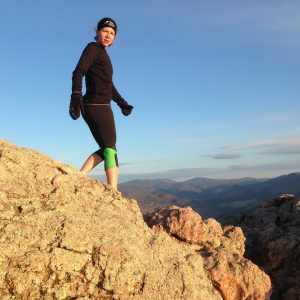 Sarah Jo Omann has raced the Horsetooth Half Marathon many times, finishing as high as second (2013). She’ll be among the favorites on Sunday. Here she is on top of the race’s namesake mountain. Given the ideal weather forecast for fast times, we’re predicting some pretty strong pressure to be put on Petersen’s 2013 course record this Sunday. It should be an exciting race in both the men’s and women’s fields. Click here for info on prime viewing spots along the course. Posted in News and tagged 2017, competitors, elite runners, Horsetooth Half Marathon.